Shake once without ice and once with ice. Strain into a rocks glass and garnish with freshly grated nutmeg. Two Sundays ago, Andrea and I paid a visit to Bergamot for drinks and dessert. Hidden away on the dessert menu beside the Cambridge Tea was the Carlsbad Flip which seemed quite tempting. 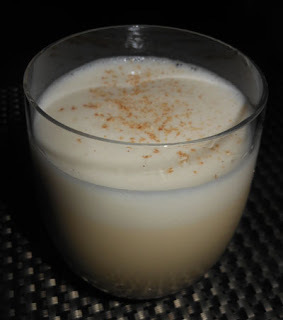 Bartender Paul Manzelli explained that he had created it one night for a guest who wanted an Egg Nog. The use of Becherovka in place of a spirit seemed Eastern Standard-inspired, such as with their Bees' Knees-like Metamorphosis and their Pisco Sour-like Kysely, but the use of Pineau des Charentes was very Bergamot. For a name, Paul chose the Carlsbad Flip after the locale where the Czech herbal liqueur is made. The nutmeg garnish combined with the Becherovka's clove to generate a gingerbread-like nose. The creamy sip contained honey flavors and perhaps a wine note from the Pineau des Charentes. Finally, the liqueur's clove and cinnamon spice rounded out the swallow.